The story continues – Another month, another big chunk of Mobile Subscribers added – 18.18 Million subscribers to be precise. Honestly, this has become such a routine month on month. According to the TRAI press release – India has reached 706.37 Million telecom Subscribers by end of August 2010 as compared to 688.38 Million in July-2010. Out of that, 670.6 million are Mobile subscribers and 35.77 million wireline subscribers. The overall tele-density in India is now reached 59.623 percent. Million at the end of August-2010 registering a growth of 2.79%. Wireless Tele-density stands at 56.61 as of August 2010. However, there are some interesting aspects about August mobile subscriber growth. Usually, Bharti Airtel and Tata bag maximum subscribers month on month, but this time it is Vodafone (12.70%), who have managed to corner maximum chunk of subscribers. 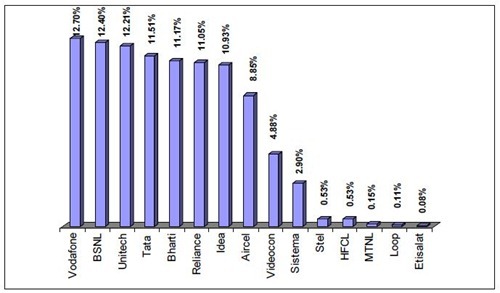 The biggest surprise to me was that BSNL (12.40%) and Unitech (Telenor) figure in the top 3 mobile operators in subscriber additions. Wireline Subscribers growth rate continues to be remain negative, where number declined from 35.96 Million in July-2010 to 35.77 Million at the end of August-2010. 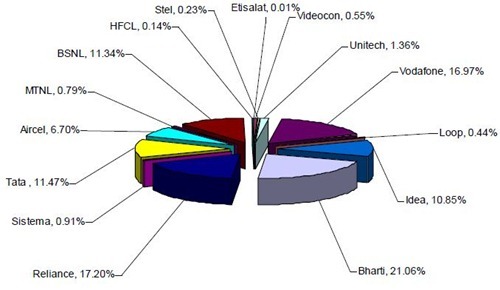 BSNL/MTNL, two PSU operators hold 83.68% of the Wireline market share. Broadband subscriber growth carried on it’s snail’s pace with adding mere 0.31 million subscribers. The overall Broadband subscribers now in India stands at 10.08 million. 700 Million and counting.Very soon we will reach 100% Teledensity.That should be a landmark achievement for India.It would be nice to know that every Indian is connected. Next target is to ensure that every Indian has access to Broadband and road connectivity.